Storm King made me look back at the stouts I’d had, and all the stouts that are out there, and the stouts I’d read that other bloggers would be sampling. I realized that this is a continuum, that stout embraces session beers, extreme beers (Dogfish Head World Wide Stout certainly qualifies), dessert beers, hoppy beers (black IPA, anyone? 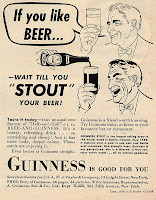 ), mild and malty beers… There is no definite “stout,” not even Guinness can claim that, with so many different versions of itself around. I love stouts and porters, in a large part because of this malleability of form. They’re dark ales (and sometimes lagers! ), yet they have enough in common to be recognizable as brethren. The Brotherhood of Stout (women welcome, too). Continuing with the stout theme, I had a pint of Guinness with lunch today. It had been a while since I’d had one, and as always, my feelings were mixed. The nostalgic part of me always wants it to be as full and rich and flavourful as I found it the first time I had one, but the many better beers I’ve had over the years combined with the dumbing down of the recipe mean that I’m always a bit disappointed by the stuff. But when you’re at a place where the other draught options are several macro-brewed fizzy yellow lagers, a couple of imported fizzy yellow lagers, a flavour-challenged red ale, and a sickly honey brown, it’s certainly the lesser of all the evils. And when I stopped being such a frickin’ beer geek for a few minutes, it was a pleasant enough pint. Just not the world-class beer that many think it to be. This entry was posted in The Session and tagged stout. Bookmark the permalink.